PFALTZGRAFF "TEA ROSE" 2-TIER TIDBIT SERVER/USA/CREAM-PASTEL FLORAL/FREE SHIP! TIENSHAN "POINSETTIA & RIBBONS" 2-TIER TIDBIT SERVER/WHT-RED-GRN/FREE SHIP! 2-TIER ADAMS "OLD COLONIAL" SMALL TIDBIT SERVER/WHT-ROSE-PUR-GRN-BLU/FREE SHIP! JOHNSON BROTHERS "BLUE WILLOW" 2-TIER TIDBIT SERVER/BLUE-WHITE-SILVER/FREE SHIP! TAYLOR SMITH & TAYLOR "CLASSIC" 2-TIER HERITAGE TIDBIT SERVER/CRM-GRN/FREE SHIP! HOME TRENDS "BLUE"2-TIER TIDBIT SERVER/SILVER DIVIDER/BLU-BLK-SILVER/FREE SHIP! 2-TIER MAJESTICWARE "PHOENICIA" TIDBIT SERVER/SILVER DIVIDER/WHT-BLU/FREE SHIP! 2-TIER THRESHOLD "VERMILLION" TIDBIT SERVER/GEOMETRIC FLORAL/STAMPED/FREE SHIP! 2-TIER MAJESTICWARE "PERSIA" TIDBIT SERVER/GRN-CORAL-BLU/STONEWARE/FREE SHIP! ROYAL CHINA CAVALIER "BLUE ONION" 2-TIER TIDBIT SERVER/SILVER DIVIDER/FREE SHIP! EPOCH "OAKBROOK" LRG 2-TIER TIDBIT SERVER/E520/WHT-BLU FLORAL/KOREA/FREE SHIP! 2-TIER PFALTZGRAFF "GRAPEVINE" SMALL TIDBIT SERVER/USA/WHITE-PUR-GRN/CLEARANCE! 2-TIER NORITAKE "M" FINE CHINA "MARIBELLE" TIDBIT SERVER/3843/JAPAN/FREE SHIP! NORITAKE CHINA "CLEARLAKE" 2-TIER TIDBIT SERVER/7914/JAPAN/WHITE-BLUE/FREE SHIP! LENNOLD "RHAPSODY" SMALL 2-TIER TIDBIT SERVER/1812/BLUE-WHITE/FLORAL/FREE SHIP! 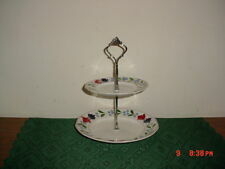 2-TIER "FLORAL EXPRESSIONS" TIDBIT SERVER/FLORAL/STONEWARE/WHT-BLUE/FREE SHIP! 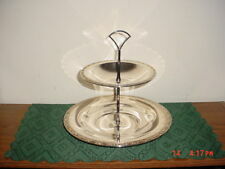 FARBERWARE "HYDRANGEA" 2-TIER TIDBIT SERVER/#4299/WHT-PUR-FLORAL/FREE SHIP! NORITAKE HOMECRAFT "MARSHLANDS" 2-TIER TIDBIT SERVER/UNIQUE/9238/FREE SHIP! 2-TIER MIKASA RONDO "COUNTRY WINDOW" SMALL TIDBIT SERVER/EJ908/WHITE/FREE SHIP! THRESHOLD "ZEBRA" SMALL 2-TIER TIDBIT SERVER/BROWN-TAN-BLUE/GOLD/FREE SHIP! 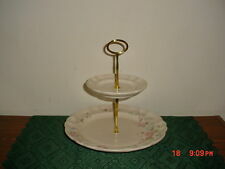 2-TIER "REGENCY" WHITE SWIRL TIDBIT SERVER/FINE CHINA/GOLD DIVIDER/FREE SHIP! 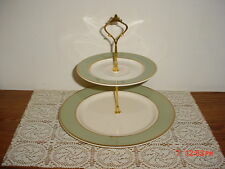 2-TIER ROYAL ALBERT HORIZONS "FANTASIA" TIDBIT SERVER/WHITE-PASTELS/FREE SHIP! JOHNSON BROTHERS OLD GRANITE 2-TIER "GRETCHEN" TIDBIT SERVER/BEIGE/FREE SHIP! WEDGWOOD ETRURIA & BARLASTON "QUEENS SHAPE" 2-TIER TIDBIT SERVER/CRM/FREE SHIP! 2-TIER TIDBIT "SNOWMAN" HOLIDAY SERVER/WHT-RED-VARIOUS/SILVER DIVIDER/FREE SHIP! 2-TIER AMCREST "WHEATFIELD" TIDBIT SERVER/GOLD DIVIDER/GERMANY/FLORAL/FREE SHIP! WORLD MARKET LRG 2-TIER TIDBIT SERVER/GOLD DIVIDER/ORG-RED-WHT-GRN/FREE SHIP! CRISTAL D'ARQUES DURAND "CRYSTAL" 2-TIER TIDBIT SERVER/SILVER DIVIDER/FREE SHIP! 2-TIER THRESHOLD "BELMONT GRAY" TIDBIT SERVER/GEOMETRIC FLORAL/GOLD/FREE SHIP! MARTHA STEWART COLLECTION LARGE 2-TIER TIDBIT SERVER/BLK-WHT/STAMPED/FREE SHIP! 2-TIER COTTONWOOD "BRENTWOOD" TIDBIT SERVER/JAPAN/WHT-TAN-GRN-SILV/FREE SHIP! 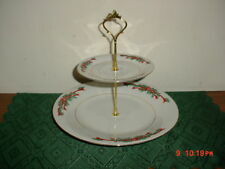 INT'L CHINA "CHRISTMAS CELEBRATION" 2-TIER TIDBIT SERVER/168/WHT-RED/FREE SHIP!